A new intellectual portrait of a prominent twentieth-century philosopher. 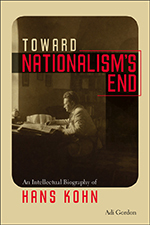 The life and intellectual evolution of Hans Kohn, a pioneer of nationalism studies. A provocative look at how Jewish intellectuals thought about Jewish religion and existence within a German philosophical tradition. David N. Myers, ed. ; Alexander Kaye, ed. Brings together key writings by one of the most distinguished and renowned Jewish historians of our time. Fascinating philosophical inquiry into post-Holocaust representations of the Holocaust in political theory, ethics, and aesthetics, and an assessment of the limitations and promise of philosophical ‘witnessing’ in relation to those issues. An exploration of the fascinating Jewish thinker Simon Rawidowicz and his provocative views on Arab refugees and the fate of Israel. An analysis of the Jewish background of an eminent philosopher. "With a graceful weave of biography, historical context, and philosophical analysis, Eugene Sheppard presents an intellectual portrait of Leo Strauss that boldly challenges the clichés that becloud his legacy." Elisheva Carlebach, John M. Efron and David M. Myers, eds. "This refreshing panorama of the diverse vistas of Jewish history and thought offers students and scholars of Jewish studies valuable new material and fresh insights across a time span from medieval to modern times." "Rich in content, a pleasure to read, an encounter with the first-rate mind of a major historian of Jewish intellectual history reflecting on issues that engaged him passionately." Essays examining the emergence of Jewish scholarship during the period 1818-1919, concentrating on the Wissenschaft des Judentums movement. "This collection showcases Mosse’s extraordinary talents as a European intellectual and cultural historian." "This collection of deeply passionate and poignant, learned, and eloquent essays by a young Orthodox rabbi facing the growing Nazi horror is important for historians, philosophers, and theologians." Eleven essays on the life and thought of Jewish philosopher and theologian Franz Rosenzweig. Jehuda Reinharz and Walter Schatzberg, eds. "A valuable contribution to the continuing flow of studies of German Jews and their relations with the rest of German society in the last two centuries."